Home › Yellow-legged buttonquail › Slaty-legged crake - Rallina eurizonoides. The slaty-legged crake (Rallina eurizonoides) belongs to the family Rallidae. Also known as banded crake, it is a water bird, inhabiting wetlands and marshes. The slaty-legged crake species are distributed in the Indian subcontinent, Indochina region and east and southeast Asia. The seven recognized subspecies of Rallina eurizonoides are: R. e. amauroptera, R. e. telmatophila, R. e. sepiaria, R. e. formosana, R. e. alvarezi, R. e. eurizonoides and R. e. minahasa. Rallina eurizonoides is closely related to Rallina canningi. The slaty-legged crake are small birds measuring 20 to 25 cm in length and weighing 100 to 130 grams. Both male and female look alike. The wingspan is about 50 cm. Their body is flattened laterally, facilitating their movement through dense undergrowth. The back is black or dark grey. The throat is white. The head and breast are chestnut colored. The flanks, belly and under-tail have prominent white and black bands. The tail is short and the legs and toes are long. The legs are greenish-grey in color. The bill is greenish grey. The irises in both male and female of Rallina species are red. The slaty-legged crake species are partially nocturnal. Their call is a repeated “kek-kek” sound. The Rallina crake species inhabits marshes and wetlands with dense vegetation, forests with waterways and dense scrub jungles with water sources. They are quite secretive and when disturbed hide in scrubs and bushes. The slaty-footed crake feeds on marsh vegetation, seeds, shoots, berries, mollusks, worms, insect larvae and a variety of insects including ants, grasshoppers and beetles. The slaty-legged crake species breed during southwest monsoon (June to September) in India. 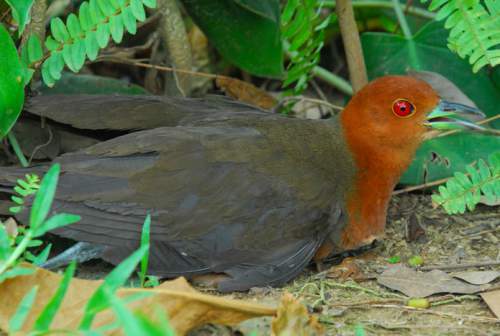 The slaty-legged crake species are highly territorial. These Rallina species built nest on dry ground and the cluster may have up to eight eggs. The slaty-legged crake subspecies Rallina eurizonoides amauroptera is distributed in Himalayan foothills and migrates southwards for wintering. The subspecies Rallina eurizonoides telmatophila is distributed in Indochina region and Indonesia. The subspecies Rallina eurizonoides sepiaria is found in Ryukyu Island (Japan). The crake subspecies Rallina eurizonoides formosana is found in Taiwan. The subspecies Rallina e. alvarezi and Rallina e. eurizonoides are distributed in Philippines. The subspecies Rallina e. minahasa is distributed in Sulawesi and Sula Islands in Indonesia. The slaty-legged crake is mostly resident in its range and in some regions may migrate southwards during winter. The slaty-legged crake global population size has not been quantified and there is decline in the population. Habitat destruction and conversion of wetlands for agricultural expansion are the main threats to the survival of these crake species. 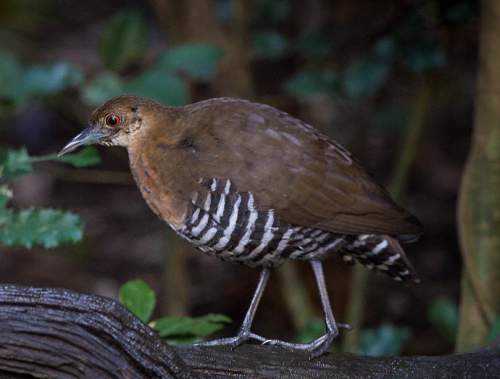 The IUCN (International Union for Conservation of Nature) has categorized and evaluated these slaty-legged crake species and has listed them as of "Least Concern". Current topic in Birds of India: Slaty-legged crake - Rallina eurizonoides.